Your doctor will recommend treatment based on the size, location, and the extent of the tumor. Your child may have more than one type of treatment. For example, chemotherapy may be recommended as a primary treatment with laser therapy as a secondary treatment. It is critical that you discuss treatment options with your doctor, and that you understand the benefits and possible side effects of treatment. Laser therapy is performed on an outpatient basis during the EUA. Laser therapy focuses a powerful beam of light through the dilated pupil or through the wall of the eye onto the cancer and the surrounding tissue. This focused and high-powered light destroys cancerous tumors inside of the eye. The small burns produced by the laser destroy the blood supply to the tumor and cause the tumor to shrink. Multiple photocoagulation sessions may be necessary. Since laser therapy is done under anesthesia, there is generally no pain associated with the procedure. For this reason, post-operative medications typically are not necessary. Depending on the location, small tumors can be treated with laser therapy alone. Tumors that are larger in size or involve the optic disc or macula may need the help of chemotherapy to reduce the size of the tumor. In this case, chemotherapy and laser therapy work together for tumor control. Cryotherapy, which freezes small tumors, is performed in conjunction with an EUA. A probe (which looks like a pen) is placed on the sclera nearest to the tumor Using a very cold gas; the tumor is frozen and thawed several times. This destroys the tumor cells and leaves a flat, pigmented scar with no signs of tumor. If tumor is evident, the treatment will need to be repeated to successfully destroy all of the tumor cells. Cryotherapy can cause the eye and the lid of the eye to swell for several days. This is normal, and your doctor may advise the use of eye drops or ointment to reduce the swelling. Chemotherapy is the treatment of cancer with drugs that can destroy cancer cells. These drugs are often called "anti-cancer" drugs. Normal cells grow and die in a controlled way. When cancer occurs, cells keep dividing and forming more cells without control. Anti-cancer drugs destroy cancer cells by stopping them from growing or multiplying. Because some chemotherapy drugs work better together than alone, often two or more drugs are given at the same time. This is called combination chemotherapy. Shrink a tumor before other therapies. This is called neo-adjuvant therapy. Help destroy cancer cells that remain after therapy. This is called adjuvant chemotherapy. Help destroy cancer if it spreads or recurs. How often and how long your child gets chemotherapy depends on the size, location and the number of tumors in your child's eye. In addition, the specific drugs that are used, and how your child's body responds to the drugs are considered. Your child may receive treatment every few weeks or every month. Chemotherapy is often given in cycles that alternate treatment periods with rest periods. This gives your child's body a chance to build healthy new cells and regain strength. Sticking to the treatment schedule is VERY important for the drugs to work correctly. If you must miss a treatment session, you should contact your doctor immediately. Chemotherapy can be given in several different ways, but is most often given intravenously (IV), through a vein. Because children who receive chemotherapy will likely be getting several cycles of drugs, a device may be surgically implanted which permits easy access to a vein. There are several devices, which may be considered. Most commonly, a port is used. Ports are subcutaneous, meaning that they are placed under the skin. At one end of the port is a small metal chamber with a rubber top. This metal chamber lies under the skin on the right side of the chest, close to the collarbone. A flexible tube (called a catheter) is attached to the metal chamber, and is feed through the large blood vessel of the neck, and into the heart. Whenever chemotherapy drugs need to be given, a needle is inserted through the skin and into the rubber top of the port. The rubber portion on a port is self-sealing after needles are removed, and are designed to handle years of needle pricks. In addition, should blood need to be taken, or fluids, or medication delivered, the port may be used. HELPFUL HINT: When the port is accessed by a needle, children commonly feel a slight prick. A cream or spray is available which can be applied to the port access area that numbs the skin prior to a needle poke. Vincristine (pronounced Vin-CRIS-teen): sometimes referred to as Oncovin or VCR. Vincristine is made from the periwinkle plant, a perennial, evergreen herb. Vincristine has anti-cancer properties because it causes cells to stop dividing. Carboplatin (pronounced car-BO-plat-in): also known as Paraplatin, is made from the metal, platinum. Carboplatin interferes with cell growth. Etoposide (pronounced E-TOE-poe-side): sometimes referred to as VP-16 or VePesid. Etoposide, works by stopping DNA (the part of the cell that directs reproduction). It also kills dividing cells. While chemotherapy kills cancer cells, healthy cells that divide at a rapid rate (like those that line the mouth, stomach, intestines, and hair follicles) may be harmed. Injury to these healthy cells is what causes chemotherapy side effects. Fortunately, these injured cells usually repair themselves after chemotherapy is completed. Chemotherapy side effects often can be controlled by medication. An important thing to remember about chemotherapy is that not every child reacts in the same way or experiences the same side effects. Some children have virtually no side effects to chemotherapy. In part, this is due to revolutionary new drugs, which have changed the way children react to chemotherapy. These drugs work to prevent problematic symptoms, making side effects less prominent. If your child does experience side effects, the most common ones are loss of appetite, nausea and vomiting. Be sure to tell the doctor or nurse if your child nausea or vomiting last for more than a day, or if fluids will not stay down. Another method of radiation therapy used in the treatment of retinoblastoma, localized plaque radiotherapy, was developed in the 1930's. In this type of treatment, a small radioactive plaque (disc) is custom made and attached to the eye. Plaque radiotherapy has advantages over external beam radiotherapy in that it delivers radiation in a more localized fashion, thereby minimizing exposure to other eye structures. It should be stressed that only a small percentage of patients with retinoblastoma are candidates for plaque radiotherapy. Children must be hospitalized for this procedure. The procedure requires two operations: the first to insert the plaque and the second to remove it. Plaques stay attached to the eye for three to seven days while the child is in the hospital. After the plaque is removed in a second surgery, eye drops are prescribed to prevent swelling and infection. Enucleation is the surgical removal of the eyeball, leaving eye muscles and the contents of the eye socket intact. This procedure is done when there is no other way to remove the cancer completely from the eye. 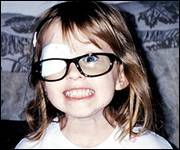 Unfortunately, loss of vision for the eye removed is permanent because an eye cannot be transplanted. Due to earlier tumor detection and improved and increased use of conservative eye-sparing treatments, there has been a significant decrease in the enucleation of patients with retinoblastoma over the past 40 years. However, enucleation is indicated for unilateral tumors that fill over half of the eye, or when there is extensive seeding of tumor into the vitreous, total detachment of the retina, or involvement of other eye structures by the tumor. The removal of the eye is done under general anesthesia, and surgery takes approximately one hour. The eye is removed, and a spherical implant made of coral or hydroxyapatite is placed into the orbit. The implant is wrapped in donor sclera. This allows the blood vessels to grow into the porous coral material. The muscles that help give movement to the eye are sutured to the implant, which allows for some movement of the prosthesis. The eye is then patched and children go to the Recovery Room. Most children go home the same day with post-operative instructions. Approximately six weeks after enucleation, your child can see the ocularist to begin fittings for a custom made prosthesis (artificial eye). Cancer cells are growing and dividing more rapidly than many of the normal cells around them. External beam radiotherapy, also called radiation therapy or irradiation, uses an invisible form of high-energy (like x-rays) to kill cancer cells or keep them from growing and dividing. Radiation therapy is used to treat cancer because cancer cells are growing and dividing more rapidly than many of the normal cells around them. The radiation treatment is painless. It is similar to having an x-ray taken, except that the child needs to hold still for a few minutes longer. A large machine called a linear accelerator directs radiation to the precise area of the eye needing treatment. The treatment is given in doses measured in units called centigrays (cGy). A custom fit, immobilization device is used to ensure that the radiation beam is delivered to the precise location of the tumor. Depending on the age of your child, sedation or anesthesia may be required to calm him/her during the procedure to make certain that they are perfectly still during radiation therapy. Most facilities use an anesthetic that allows your child to recover quickly. The treatment takes only a few minutes and can be stopped at any time if the child experiences any difficulty. The entire procedure generally takes from 30 to 60 minutes. Nausea and vomiting are occasional side effects of anesthesia, but are well controlled by anti-nausea drugs such as Zofran. You will not be allowed in the room during treatment, as this would expose you to needless radiation. Younger children may find it frightening to be left alone in the room during therapy. It may be reassuring to explain that you are just outside the room. In some hospitals, viewing windows or closed circuit television allow you to watch your child during treatment. Your child may feel easier knowing that you can see him or her throughout the treatment. A trip to the radiation therapy room ahead of time may also help relieve fears about the treatment. Radiation is usually given every day for a specific number of days. A radiation oncologist, a medical doctor specialized in using radiation as a treatment, will work along with your ophthalmologist to determine the amount of radiation to be given. The currently accepted protocol is 3,500 to 4,000 centigrays (cGy) of external beam irradiation delivered in divided doses over 4 to 5 weeks given once or twice daily. The radiation oncologist will explain how the radiation will be given, what radiation is and how it works, and discuss any potential side effects. Your child will not be radioactive during or after radiation therapy. Neither you nor anyone else need fear contact with your child. The skin around the area receiving radiation may appear to be "sunburned" or red and sore. This will go away soon after the treatment has finished. Some hair may be lost from the back of the head. This loss is usually temporary. Hair growth will begin about 3 months after the radiation treatment is completed. Retinoblastoma is extremely sensitive to radiation; however, radiation therapy can cause mild, short-term side effects, and sometimes there is permanent damage that may not be evident until months or years after treatment. External beam radiotherapy is most often used to treat patients with bilateral retinoblastoma who are not able to receive local treatment (such as laser or cryotherapy). Radiation is generally preferred when a tumor recurs after initial treatment, a tumor extends into the bones around the eye (orbit), when the second eye contains a tumor larger than 16 mm in diameter, when the tumor is near the optic disc or center of vision (fovea), when multiple tumors are present, or when there is extensive vitreous seeding. It may also be used to treat the eye socket after an eye has been removed if studies show extension beyond the area that had been removed to prevent further spread of retinoblastoma. Complications from radiation treatment include cataract (radiation can damage the lens of the eye and cause a cataract), dry eye, and abnormal orbital bone development (mid-facial hypoplasia). An important long-term complication of external beam radiation is the possibility of developing radiation-induced tumors. Several studies suggest that patients with hereditary retinoblastoma have an increased incidence of secondary tumors, and that the incidence rate is further increased in those who receive radiation therapy. Your child's ophthalmologist or radiation oncologist can tell you more about long-term effects in relation to your child.